Kenyan Marketer: 5 Reasons Why Scangroup's Attempts to Monopolise The Industry Should be Controlled. 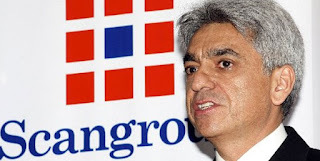 Just before I give you my reasons why I strongly feel the government should control Scangroups attempts to monopolise the Media buying & advertising industry here's a short story of what Scangroup really is! BIG! Scangroup and Ogilvy, associates of WPP, a global advertising and marketing services company, launched two advertising firms last year, Scanad Ghana Limited and Ogilvy Ghana Limited. The move was aimed at expanding Scangroup and Ogilvy operations in Africa and to serve an existing demand for marketing and communication services & established to take over the existing advertising and promotional business of Media Majique & Research Systems Limited which has traditionally traded as MMRS Ogilvy and Ogilvy Africa Media Ghana Limited (OAM) respectively. Locally the marketing communication agency has in the past four years completed multi-million acquisition deals across East Africa.Scangroup also purchased a 51 per cent in Ogilvy Africa in cash and stock transactions worth $2.3 million that gave it minority stakes in eight media agencies in South and West Africa of between 6.4 and 15.3 per cent.In buying Ogilvy Africa, Scangroup tapped a long list of multinational firms including beer giant SABMiller, Unilever and BAT.Others are Multichoice, Zain and Sun International, which promise to rev up its profits given the huge media spend of these firms.In Kenya, the firm gained access to high net-worth clients such as Barclays Bank, Kenya Airways, India's Bharti Airtel, and Telkom Kenya. According to Scangroup’s website it’s Africa's leading marketing services group offering a comprehensive and integrated range of Advertising and Communication Services in Traditional Advertising, Media Investment Management, Marketing Consultancy, Public Relations and Experiential Marketing. Public relations consultancy is carried out through Hill & Knowlton while Roundtrip, a subsidiary of Scangroup, carries out experiential marketing and event management while Smollan East Africa Limited provides field Marketing Services, Market Intelligence and Brand Activation. Squad Digital Limited is East & Central Africa's leading digital agency. It is a joint-venture between SITG India, Quasar and Scangroup. Here are a few reasons why Scan group’s rapid expansion plans may spell danger to the industry. 1. 1.Poaching talent from smaller agencies. Everyone understands what this means. Well to the person being poached this may mean more cash ,better allowances and good perks which is what almost every Kenyan wants. However the downside of this is the smaller Kenyan owned agencies may never grow to see their 5th birthday! Many small business owners fail to grow just because they cannot afford the talent to help them grow. Scangroup can easily kill competition from the smaller upcoming agencies by simply poaching employees from them; and its already happening! According to the Kenya Research Advertising Foundation 2011 report agency booking was at 51% to 49% percent direct bookings and Scangroup controlled 70% of the agency bookings before fully buying out Ogilvy! That means the figure could be higher this year. What does this mean? For media houses you have to comply and take in all their terms & conditions! This further means that for major media buyers like Safaricom can withdraw advertising spending on certain media houses if they cover certain stories that tell of their failures! This leaves the media houses so desperate! Its all about take in the cash; give the public half baked stories that are laced with lies just to project the image of the big brands and since Scangroup has the bulk of these brands the media houses have to dance to their tune! Well as a marketer I understand how the smaller brands feel the heat when they try to slice the bigger brand’s market share. Keroche breweries knows what it means taking EABL head on! It has taken Tabitha Karanja sweat blood and tears to be where she is now! Back to Scangroup the agency is just too big to compete with! They have certain multinational companies that are no go zone for other agencies. This is partly due to the long credit periods that multinationals ask for; If a small agency tries to handle big accounts they’ll collapse due to lack of cashflow and lack of technical capability to handle the big brands. If you are thinking of probably pitching for Safaricom’s PR business they could have as many as 27 events in a month! Just picture that!!!! It’s gone a little bit too far that brand managers invite smaller talented agencies to pitch their ideas and then send the proposals to the latter! The competition gets stiffer; since Scangroup is doing everything these people slowly take in business & slice business from other agencies. If Scan group gets PR business through Hill & Knowlton slowly McCann will get on board to do media and it goes on that till the whole account is handled by various agencies under scan group. We all understand the language of kickbacks in Kenya. Scan group as a listed company has investors, some of whom are the CEO’s and senior managers in these blue chip companies who are also clients of Scangroup. It gets even trickier when some top executives in the corporate world get ‘free equity’ or are co-partners with Bharat Thakrar in some of his agencies. For smaller agencies who cannot 'bribe' their way into bigger accounts will stand outside and watch as a few make a killing! We have seen the poorly scripted ads on TV, creative work on billboards that’s so lame. It gets worse when the same people work on different accounts and give the same ideas & concepts to both clients! Haven’t you seen billboards that resemble others? Or companies implementing ideas that were first used by another brand? It all starts at the creative department of agencies. Same guys worked on two accounts and delivered the same concept! I am not saying Scangroup does lame work for its clients in fact I know of very talented people working in these agencies however the same people work on several other brands thus transfer ideas to other brands! It’s worse when a new client is given what didn’t work with the other client just because one feels that it should work! This has to be checked! 6.Lack of equal employment opportunities. This is more of a bonus point however it still counts. A good number of very talented Kenyans are jobless because they don't know people out there. We have very many PR, Journalism, Communications , Bcom- marketing and media graduates who are jobless. If a few Kenyans control the industry that means that their daughters, nieces, nephews,sons and friends will get jobs and internships in these agencies. Days are long gone when you used to drop your CV and get called the following day! By this I don't mean that Kenyans who work in these agencies are not like the rest but its a game of being from certain families and races. Getting a job in some of these agencies is at times not an issue of being qualified just like a girl can't really work for DJ CK's Capital group if she isn't yellow yellow! You know that too! The colour of your skin matters if you will get a place in the media mogul's empire! Thank you a lot for providing individuals with an exceptionally memorable opportunity to check tips from this blog. and check again here regularly. I am quite certain I’ll learn lots of new stuff right here! F*ckin’ tremendous issues here. I am very happy to look your article. I wished to thanks to your time for this wonderful learn! webpage and look forward to so many more cool minutes reading here. appreciate you for these precious points you are giving at this website. My considerable internet look up has now been paid with good quality content to go over with my classmates and friends. site with very many awesome people with useful plans. here. Thanks once more for a lot of things. marketplace leader and a large component to folks will leave out your excellent writing because of this problem. An attention-grabbing dialogue is worth comment. I feel that it's best to write extra on this topic, it won't be a taboo subject but typically persons are not sufficient to talk on such topics. Well I sincerely enjoyed studying it. This subject offered by you is very effective for good planning, hard work and a great team always make a spotless work...I read your article on experiential marketingand find that you make nice point on the service..
What a great web blog. I usually spend hours on the net reading blogs on experiential marketingAnd, I really would like to praise you for writing such a fabulous article. This is really informative and I will for sure refer my friends the same.